With thousands of UN peacekeepers leaving Liberia after 13 years, the country could be facing the most important transition in its history. 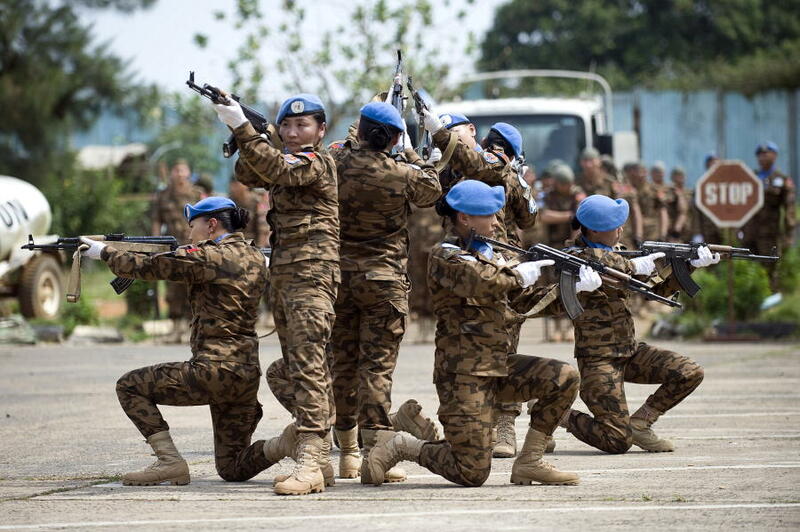 Mongolian soldiers in the United Nations Mission in Liberia (UNMIL) perform a tactical exercise. Credit: UN Photo/Christopher Herwig. So, it was with a mix of both uncertainty and resolve that our small sliver of a country bid farewell to the United Nations Mission in Liberia (UNMIL) on 30 June. This came nearly 13 years after the UN Security Council Resolution calling for 15,000 military personnel to maintain law and order was passed. Back then, in 2003, Liberia and its people were war-weary and battle-scarred after years of armed conflict. Today, post-Ebola, Liberia is also in a delicate situation and just beginning to piece together the remnants of normalcy in a region facing threats of extremism. Whether this is our lucky or unlucky 13th year remains to be seen. Yet, for all the hemming and hawing about how fragile Liberia remains ahead of elections slated for October 2017 – in what could be the country’s first ever peaceful regime change – UNMIL had to go. And while some UN personnel will remain in their posts – 1,240 military and 606 police officers with a limited number of civilian staff – an eventual total withdrawal is not only foreseen but necessary. History has proven that multi-billion dollar peacekeeping missions have produced mixed results. They can be politically problematic, financially costly, and unviable. And they operate with impunity and under a shroud of secrecy, as evidenced by the alarming numbers of sexual abuse cases and the lack of transparency around funding streams. As a case in point, it is nearly impossible to gauge the total amount spent on Liberia’s security sector reform, with a dozen or more donors all contributing to several aspects of the exercise at different intervals. Moreover, peacekeeping missions create a false sense of permanence and security, especially when their role is temporary and largely symbolic. And they cost a fortune to maintain. For instance, the training of 2,000 soldiers in Liberia is estimated to have cost between $95 million and $200 million. UNMIL could not remain in Liberia forever, nor did we want it to. And its withdrawal has urged the government to focus less on external intervention and more on building a holistic security system, by investing in the bureau of immigration, drug enforcement agency, and national security agency as much as it does the police and army. This can only be a good thing considering the Liberia National Police’s (LNP) and Armed Forces of Liberia’s (AFL) recent chequered past. For instance, in 2014, riots in mining enclaves occupied by foreign multinationals tested the capacities of the national police, whose slow response and lethal use of force sparked domestic and international censure. And when 15-year-old Shaki Kamara bled to death in August 2014 after being shot during an army scuffle with civilians in West Point, we also began to wonder about the readiness of the AFL. After these episodes, surely the methods of private security firms DynCorps International and Pacific Architects and Engineers (PA&E) – which were subcontracted to train the army alongside US military personnel – should have been investigated. Amidst the uncertainty around UNMIL’s exit, opinion in Liberia understandably remains mixed. Admittedly, Liberia’s government has taken some positive steps in this regard. Though it requires revision, a national security strategy was adopted in 2008, which shifts attention from a narrow focus on state security to human security emphasising “efficiency, transparency, accountability, democratic and civilian oversight…respect for rule of law and human rights”. 30-35% of a security transition plan – approved by government and endorsed by the UN Security Council in 2015 – has already been implemented, with 60-65% set to be completed by the end of the year. In response to high attrition, the AFL has trained more soldiers and the 2,000-person force continues to receive professional training and seems bent on remaining apolitical. Security councils have been established in five of Liberia’s 15 sub-political divisions. And the country’s security legislation has also been updated. In terms of security legislation and policies, Liberia is far ahead of most, if not all, the countries in the West African sub-region. However, despite Liberia’s gradual progress, there are too many gaps to inspire complete confidence. To begin with, the Security Transition Plan estimates that the country will need a whopping $104 million to fill holes left by UNMIL. After re-prioritisation, this cost was reduced to $38 million with the national government allocating $20 million in the last fiscal year – though only half of this has been disbursed. Another issue is whether Liberian security forces can take over UNMIL’s duties in terms of VIP protection, aerial surveillance for border patrol and management, maritime and prison security, and bomb disposal. Furthermore, Liberia has yet to fully tackle issues such as the protection of civilians, intelligence gathering, and the investigation and prosecution of crimes. The country’s 6,000 police officers cannot provide effective frontline security services because of limited training and logistical challenges. And with UNMIL’s withdrawal, peace will continue to be fragile if Liberia focuses exclusively on security while neglecting the rule of law – particularly public defence and legal aid. In all this, it is also crucial the country confronts soft security, including poverty, unemployment, health pandemics and demographic changes. These challenges will become increasingly paramount since UNMIL supported the livelihoods of hundreds of Liberians across the supply chain. Other state agencies must handle these basic social services and infrastructure, which are fundamentally developmental in nature. A ‘whole of government approach’ is thus the only way forward in the post-UNMIL era. It is clear that Liberia cannot continue to broadcast its security and development needs outwards. Instead, with UNMIL’s exit after 13 long years, Liberia must look inwards to manage what could be the most important transition in its 169-year-old history. Robtel Neajai Pailey is a Liberian academic, activist and author based at the University of Oxford’s International Migration Institute (IMI). Thomas Jaye is a Liberian academic who works on post-war reconstruction and peacebuilding; he is also deputy director for research at the Kofi Annan International Peacekeeping Training Centre (KAIPTC) in Accra, Ghana. A version of this piece was published on Open Democracy.